Developed to provide nurse clinicians with a resource for the management of adult critical care patients, Mosby's Critical Care Nursing Reference condenses the most essential information needed by nurses working in the ICU. This valuable, pocket-sized reference provides information on broad topics that apply to a variety of critically ill patients, as well as detailed information on organ diseases. Chapters are dedicated to psychosocial concerns, complementary therapies, and the unique needs of a pediatric patient in an adult ICU. Therapeutic modalities and pharmacology are both examined, with information that is useful for the student, the new nurse, and the experienced professional. Handy size allows portability and ease of use in working conditions. 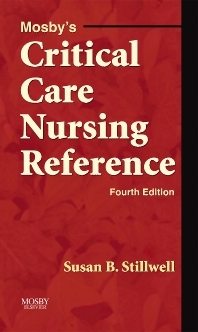 Contains both general information on patient care, as well as specific details outlining nursing procedures in a professional setting. Organization of material presented allows for quick access of desired subject matter in critical care situations. Allows critical care nurses to quickly assess, diagnose, and facilitate the care of patients in an ICU setting. Clearly organized appendices allow the user to rapidly obtain frequently needed data.